Home How do you care for an ailing parent? I’ve never had to care for an ailing parent. Never had to check them into a nursing home, never had to arrange for hospice care and never had to act as a guardian for the two people that raised me. I hope I never have to, but I know someday it will come down to me, my brother or sister having to make decisions for the very people we thought were going to live forever. 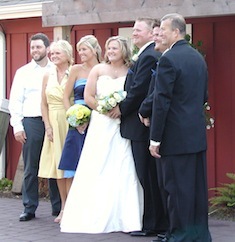 Nick, my mom, Logan, Sarah, Bryan, Me and my dad at my brother's wedding last year. I watched my dad deal with this when his father passed away suddenly almost 20 years ago. All of a sudden he had a mom, my grandma, who was so used to living with someone else that she really couldn’t handle the pressure of being by herself after so many years of being half of a whole. I can’t imagine the responsibility he faced, can’t imagine the issues he had to deal with when his sister argued with him about proper care and can’t fathom what it was like for my grandma to be by herself. My parents are still in good health (hell, they’re only 61) so I don’t plan on having to deal with this for a while, but I have plenty of friends that are being thrust into this. I want to help, but I just don’t know how besides offering my time and shoulder. I’d like to do more and I’d like to be able to point them in a direction for them to obtain more help, whether for themselves, their spouse or the surviving parent. Where do you show them to? Who do you ask for help when having to deal with this? Do hospitals have people? What about the emotional toll? You’d think there’d be books and clubs and groups and forums and places for people to go to talk about these kind of things. Help me out here. Where would you go? What would you do? Who would you ask? I will be the aging parent here soon, and I have done the following: 1)I have long term care insurance (got it at age 50 when it was cheap to get) to help with my care 2) I have shared with my daughters where all my important papers are and what my wishes are 3)I have a living will and a medical power of attorney, and a full will 4) My daughters and I have had conversations on which one might be the caregiver. Other than that, I hope none of this is necessary, but I’ve at least planned. There are now services like Home Instead that help seniors, there are gerontologsits who specialize in the agting, there’s Hospice for the dying, and there is a new field called geriatric consultants. Retirement homes have them, and the advertise in hospital periodicals. I always enjoy your posts, and this one really hit home. My mother spent two months in the hospital and a health rehabilitation center over the summer, and her sudden decline was a frightening wake up call. I, along with my siblings, were definitely unprepared. We had to scramble to take care of power of attorney, long-term care insurance, and health care proxy issues while my mom was hospitalized. She is now in an assisted living facility and doing better. I live in Vermont and found support and guidance through a local Council on Aging. I would recommend anyone with an aging parent to contact this type of organization. Good article Tyler. Its tough on all those involved. Sometimes I wonder if as a society we are failing at taking care of our elderly. There used to be a time where children and parents lived in the same house. I often wonder what it would be like to have an extra set of hands to raise the kids or have the kids help with aging parents. This is a subject I think I will be studying more. My grand parents lived with us six months out of the year (as snowbirds) and I think it shaped who I am today. I feel that not giving my kids the same experience could be robbing them of who they could be. Silly? It was also unheard of to leave town for a job, too. Everything changed when the economy became global.